Forget lengthy transfers over the cloud. Every day brings you the new technology to make your work more relaxed, and this technological piece of marvel lets you back all the data you need from your phone to a separate drive for storage and to free up space. External storage for iPhone gives you a lot of space to save you most treasured data while efficiently solving the awkward situation of Memory Full. After searching high and low, we provided you with a guide that will help when selecting the ideal piece from the overwhelming multitude of choices. Capacity: The size of files you intend to save on the external storage will determine the capacity of the external storage you should opt for. High-quality photos and HD videos usually occupy more space of the iPhone storage while documents take less space. Choose a drive that matches your needs. A more significant capacity should, however, mean more cost. Durability and security: If you are frequently using the external storage, you need one that can make it through everyday use. Consider the physical strength of the casing and connector and that of the NAND memory chips. A metal case and a robust connector will guarantee physical durability. Consider models that feature security encryptions like passwords and Touch ID. This will help secure any private information in the drive. Speed: If you are going to transfer large files, speed is another consideration to have in mind. 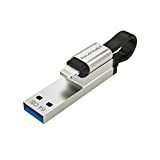 USB 3.0 flash drive has transferring speeds of 60MB/s which makes it makes it more superior to USB 2.0 which usually have speeds averaging at 5MB/s. USB 3.0 is compatible with USB 2.0 ports. You get speeds of about 25MB/s when you use USB 3.0 flash drives on USB 2.0 ports. The cost of USB 3.0 flash drives is much higher than USB 2.0 flash drives but offer you better performance. Extras: look out for features like an option for automatic backup. You may desire a system that regularly backups your external storage devices. The extra extension ensures the connector of the external drive works with most of the thick cases without having to take them off. The iDiskk external storage works with a range of iphone phones. It’s easy to use and will easily fit on the phone. The unit may appear small but has a large capacity of 128MB to accommodate lots of things. It’s also based on advanced 3.0 technology and is MFI Certified. You, therefore, won’t need to worry about the accessory damaging your phone or the things stored inside it. It supports Touch ID Encryption which gives you seamless control. 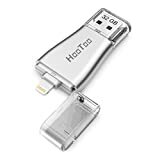 The gadget helps you to transfer movies, music, video clips, and other things from your phone to a desktop PC, laptop, notebook, tablet, and other things. Moreover, the piece works with many video formats such as AVI, MP3, M4V, MP4, MKV, MPG, MOV and many more. With this external storage memory stick adapter by Kimiandy, transferring music, videos, and other things from devices will be much easier. The USB stick has a 128GB capacity which is pretty decent and should hold a relatively large volume of items. It comes in a simple and practical 3-in-1 format to work with different devices. These include netbook, laptops, tablets, PC and also iPad. The gadget is compatible with Operating Systems (OS) such as Android, iOS, Mac, Windows, as well as iPhone 7/ 6 Plus/6s Plus/ 6 /5s 5c / iPad Air and other devices. Using it is straightforward and doesn’t require additional programs or software. Forget USB flash drives that are difficult to use and operate. With the Sunany memory stick, backing up photos, videos, music, and other things is as easy as clicking once. The unit also has a good storage capacity of 128GB which should suit most requirements. Many users praise its fast transfer speed of 80MB/second (Reading) and 40MB/s (Writing). This will complete a process within a short time. And thanks to the superior nature of good technology, the gadget ensures the original quality is maintained. The USB stick should work with PC, Mac, Android, iPod, iPad, Laptop, and many other devices and OS/programs. It also boasts of good encryption for maximum security. Watching movies, listening to music, or viewing pictures is easier with a large capacity USB Flash Drive. This one by RAVPower is a good option thanks to its good storage size of 64GB. The unit uses 3.0 technology and works with various devices. These include tablets, phones, iPad, and PC. It’s also compatible with Operating Systems like Windows, Mac, iOS, and Android. Installing and using the unit is straightforward and you won’t need additional OS, Programs, or Software. 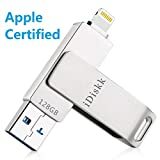 The Flash drive gets a thumb up for its relatively fast transfer speed (80MB/s (reading) and 30MB/s (writing).It’s also MFi Certified to assure you of good quality, reliability and safety. This piece is for those who can afford to spend a little bit more for peace of mind, this external drive for iPhone has always left them satisfied. Apart from the extraordinarily large storage capacity, the fact that it is entirely up to par with craftsmanship so you won’t have to buy an upgrade sooner is another feature that differentiates this piece from its peers. With an enormous capacity of 128 GB to offer, it is most voluminous regarding extra storage, it could even compete with external HDDs (hard disc drives), with the advantage of being far more portable. 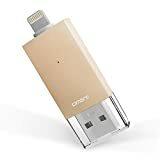 It automatically backs media from your camera roll and can perform optimally with your Mac or Windows computer by connecting the 3.0 USB, considering it has exFAT permission. Covering it is a lightweight aluminum casing which makes it sleek and can make it through after so long of use. It has a cap with a ring for tethering making it easy to carry. Supports all the popular formats of music, pictures, and video. This drive from SanDisk is the other fairly inexpensive drive but offers outstanding performance that rivals that of pricier competitors. It comes with a curbed plastic connector that fits behind the back of the device for convenient holding during use. This option also backs all your media automatically and can only be used along with the iXpand app installed on your iPhone. Another great feature that we found incredibly useful is the ability to save photos and videos directly to your phone. You don’t need to take time to transfer the captured moments when you want to free your cell phone. SanDisk is well known for innovation and thorough testing when it comes to external drives. It combines speed, durability, value, and convenience, this flash drive is the ultimate choice for most people. With 32 GB, 64 GB, 128 GB and 256 GB capacity options, you won’t miss your preference. We couldn’t resist adding another entry from HooToo. It simply does its job well and does it much faster. It’s been built with a stylish glossy finish body, a minimalist and modern design and weighs a mere 0.25 Oz. This makes it one of the smallest and lightest available. Captured photos and filmed videos from your Lightning iPhone or iPad can very competently and quickly be transferred to the 64 GB storage capacity at 30 MB/s while the maximum reading speed is 80 MB/s. Oh, and another good thing is this unit received an authentic Apple MFi certification so it should work correctly with all Apple devices. HooToo gives an 18-month warranty in case of any defects. The premium aluminum body makes the drive super durable and very eye-catching. One of the most significant plus points about this entry is that any 8-point lighting apple device accepts it. At a read speed of 80 MB/s and a write speed of 40 MB/s, it will save you time while transferring files of large capacity. Even better, you can directly record captured images and videos to your external drive, leaving you with ample space on your device to use as you please. It is important to note that all major formats of music, photos, videos, and documents are supported, so you’re fully covered. The ‘Witstick App’ launches as soon as you plug the drive into your phone for even more ease of use. Users also appreciate that the drive is attractive and has some of the highest rated security measures the password and Touch ID. The company avails 32 GB, 64GB, and 128 GB capacity variants. The app allows you to share a file directly from your external drive to social media. There is a One Touch backup feature that means you touch to back up all the data on your phone onto the Omars external drive. If you are prepared to make a substantial investment in external storage for your iPhone, then check out this fantastic quality. 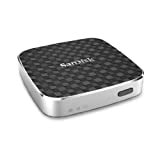 Through your web browser or the SanDisk app that you’ll be expected to install, you get to store and share multi-media files across to your iOS, Kindle or Android device via a Wi-Fi connection. Incredibly, this unit allows you to stream videos stored in it up to 5 different devices simultaneously. Up to 8 devices can access it at a time when you only need to access other lighter files like pictures and documents. The company thought you might require extra storage at some point and included an SD memory card slot. You can also whether or not to set Wi-Fi password protection to safeguard your data. And even with all these fantastic features, it is still slim, and compact t fit into the tightest of pockets. They are available in 32 GB and 64 GB capacities. You don’t need cables or internet connection, and the memory card slot can be used to view photos from your camera on your mobile device. Each of your friends will be in awe of your new piece of equipment. It is pretty to look at and also dependable and easy to use. Because the drive supports exFAT and has a read speed of up to 80 MB/s and a write speed of 30 MB/s, you will have absolutely zero issues about its speed. A further nod to the company’s innovativeness is the allowance to save media directly to the drive without saving them on your iOS device. If you’re still not impressed, there is a password and touch ID protection in case you need to keep your data safe. It is perfect for iPhone owners who have large files they want to backup or photographers with many pictures. You should find click to buy this drive; you’ll be glad you found this option. The caps are tethered so that they don’t disappear. Documents can be shared with a third party. All the finalists for this important category won their high marks for the excellent job they do. 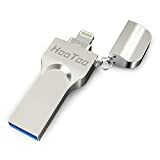 Nevertheless, there is a number one So you will surely find that you can’t do much better than the HooToo iPhone external drive with a connector. It is the favorite to many and built for quality and longevity. The first pick prides itself on its ease of use, flexibility, and portability. The external storage device supports all media formats and is compatible with most iPhones and computers. It’s capable of transferring files as large as 4 GB thanks to exFAT adoption. The USB 3.0 lets you enjoy close to 8.0 MB/s reading and 30 MB/s writing speed while the lightning port allows 30 MB/s reading and 10 MB/s writing speed. Another great specification with this unit is the safety precautions installed as the password and touch ID meaning even if someone came across it; they won’t access the content. The iPlugmate app pairs perfectly with this drive to relieve your iPhone of the bulky data you want out. The cap is tethered to the device to secure it. With the rise of downloadable app, games and media comes the need for extra storage. This option allows you to instantly free up your i-device memory with 64 GB of backup space. 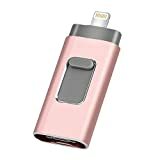 The RAVPower iPhone flash drive boasts speeds of up to 80 MB/s and 30 MB/s reading and writing values respectively and the exFAT authorization means you can transfer files as large as 4 GB. That makes it perfect for movies and hefty games. But the most impressive part of this storage device is that it can act as a charging cable for your Apple gadget. It’s MFi certified for being compatible with most Apple products giving you the flexibility to store files from old devices. Another bonus is the fact that it comes with a touch ID and password security protection for your data. Allows you to backup contacts and restore to another device. This option integrates excellently with iPlugmate to enable you to save taken pictures and videos directly. It is a waste of time and money to purchase something that will not deliver the desired results. This external iPhone drive comes with a 32 GB memory card which offers ample storage when it is needed the most so that you can backup or free some memory on your iPhone. In fact, you don’t have to save pictures and video, just take them using the App camera and the media will be automatically saved on your drive. It shouldn’t come as a surprise that this is one of the best external storage for iPhone. This piece by G-ting is extremely durable, portable and functional. No wonder users feel so feel confident, secure and satisfied each time they plug it into their Apple devices. This unit couldn’t be more natural and more pleasure to use with the 80 MB/s reading and 40 MB/s writing speeds. Another base benefit has a friendly streaming app which supports all music and video formats and is easy to use too. Privacy and security are also heightened by open touchID and password on setting In the ‘i-Easy Drive’ app; you can choose to lock selected files. It is compatible with iOS, Android devices, and PC.